Lake House Review: Work has still not begun on a review of how funds were handled to purchase and renovate what is now the Lake House at Lake Anne. It was decided an independent review was necessary after renovations ended up to be roughly three times what was budgeted, and money had to be borrowed from the Reston Association’s operating budget to cover the deficit. The RA Board previously went through months of negotiations with the firm MediaWorld, who had offered to do the review for just $1 if volunteers agreed to help with some of the busy work, but after more than two months of back and forth, it appears negotiations have been stalled or possibly terminated. Development on the Horizon: Per the usual here in Reston, there are several major developments in the works around town. In particular, just before the holidays, more news broke about Vornado’s planned development near Wiehle-Reston East Metro, Comstock’s hopes for a development near Reston Station, and an approval for planned lofts by Pulte Homes near Reston Station. 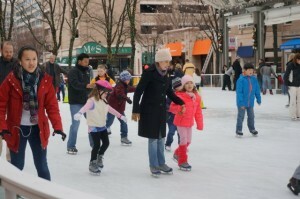 Very Little Crime to Ruin the Holidays: Thankfully, very few crimes made headlines in the Reston area over the holidays. There were minor break-ins at the Carlton House condos at Reston Town Center and the Hidden Creek Country Club, and a tragic accident in D.C. involving a Herndon man. In a bit of good news, the community pulled together to help find a teen boy who went missing in North Reston within 24 hours. Fourth Spot Opens Up on RA Board: Just before the Christmas and Chanukah holidays, North Point District Director Danielle LaRosa of the Reston Association Board of Directors tendered her resignation. LaRosa also serves as the board’s current treasurer. LaRosa’s seat joins three others that are opening up on the board when three-year terms come to an end in April, for a total of four out of the board’s nine seats up for election when voting begins March 3. The candidate elected to fill LaRosa’s seat will serve the remaining two years of her three-year term. A Candidate Information Session will take place tonight for those who want to learn more about running for the board. As we kick off 2017, what are you most interested in or concerned about around Reston? Tell us what you most want Reston Now to cover in this new year.